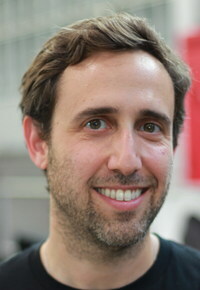 For our interview today, we have an interview with Gabe Grifoni, CEO and founder of Rufus Labs(www.getrufus.com), which has has developed an Android-based, wearable device which is aimed at use in the enterprise, warehouses, and factories. Rufus Labs is one of a number of hardware startups which have started to proliferate in the community, due to low cost hardware, 3D printing, and crowdfunding sites like Kickstarter and Indiegogo. What's your product, and what is it used for? Gabe Grifoni: At Rufus Labs, we are focused heavily on building wearables and technology in a wearable platform for the enterprise. Our products are designed for use by warehouse workers, retail staff, employees in manufacturing plants, by airlines, any place where people are moving boxes, picking and placing, shipping products, or getting things ready for pickup. Right now, the tools there are old and outdated, and mostly handheld. We're making changes to improve the efficiency, make those jobs a lot better, and bring safety improvements to the floor, and keep people safe. That not only helps companies with things such as insurance and worker's comp, but from a more human standpoint, employees are not getting injured by vehicles such as forklifts. We're focused on a product which makes for a more efficient, safer, workplace. .
Talk more about why people would use your wearables, versus what is used today? Gabe Grifoni: The most advanced companies today are using devices that are hand held, like a tablet or smartphone. That's great in terms of functionality, as they usually run something like Android. Our tool does the same thing. Where they start to fail, is one, they are handheld. Plus, tablets are actually pretty new, and not so many people are using them. There are a lot of people still using walkie talkies, clipboards, and handheld scanners. Those handheld scanners cost $2000 to $2500, and they weight 10 pounds. Plus, they don't collect data, and use really old, limited software. When we talk to customers, we hear about these pain points. One thing we address, is the portability of tools. Whether you are using a tablet or a 10 pound, $2000 device, they are both heavy, handheld, and workers still have to put them down somewhere to do their job, and then pick them back up. That really slows things down. The additional thing, when you look at wearables, they are worn, and we can start to learn more about what is happening in the workplace, like what routes workers are taking through a factory, or which workers are best at what tasks. You can learn a lot when you use wearables. You can learn that some people are good at particular tasks, and slower at others. You can help prioritize and assign jobs, or figure out where you have efficiency holes and improve them. You can see if workers are taking appropriate breaks, and make sure that they are not violating requirements on break times. Another big area is safety, as I mentioned before. Right now, the devices being used have no methods of alerting and communicating with people. They might use a walkie talkie to communicate, but there's no way to send an update to just specific people, or alert people when they are in proximity to things they shouldn't be. Because of that, wearables have a good leg up. Plus, because they are on a person's body, they might not hear someone calling, or might not feel a vibration. With wearables, you can use haptic motors to provide feedback, and that means that 99 percent of the time, you should be able to grab a worker's attention for safety or communications, or task assignment. Those are some of the benefits of wearables. Plus, if you look at the cost of current devices, and that $2,000, our devices are built at a cost of a third of those. That's a huge capital savings per employee. What's your background and experience in the industry? Gabe Grifoni: I have a very different background than a traditional tech person. I started out working in my grandfather's hardware store, which is where I got my first taste of logistics, unloading boxes and restocking shelves. I also grew up building and soldering things. However, my parents were actually in clothing, and had a few stores in the city. Clothing, to some extent, is wearables. Then, in college, I was a computer engineer for a year and a half, but then I figured out I didn't enjoy coding. So, I switched to a degree in business and marketing. After college, I didn't go into engineer, I went into the marketing and entertainment side. I actually spent a decade working in advertising and marketing. However, my tech background allows me to understand what's going on with engineering, mechanically, with CAD and 3D printing, and I've used my engineering skills on that, plus soldering. It's kind of the two halves that got me here. How did you go from marketing and advertising to a hardware startup? Gabe Grifoni: I had actually transitioned to the writing side, and focusing on tech. That got me to CES for some technical writing and journalism, and I started checking out the scene. As I started to see what was being built with hardware, and from my background, I realized that these were the kind of areas I wanted to focus on. Today, with 3D printing and the hardware available, it's much easier for people to get in the door. That CES was in 2013, and there wasn't a lot on the market at the time. I think in terms of wearables, Pebble was the only thing that was out. However, that's really a device from the 1800's with a screen, and that didn't seem like the way to go. I thought we could do it better, and so I turned back to my tech and engineering roots and started the company. It started with the four hour drive home and my imagination, and then I spent five days at home drawing and planning it out, and finally rallied a small group of friends to co-found the company with me, and we raised friends and family funding. That's how we got our start. So where are you now with your product? Gabe Grifoni: We're just finishing up everything at the Make In LA hardware accelerator. We're finalizing the DFM, design for manufacturing. We've just got a couple more things we need to do with our mold to build our components, and we have a contract manufacturer in Moorpark building things for us in the U.S. We will be shipping sometime in August, and we have a few FCC hurdles to pass, which I hope won't delay things, and we're preparing for mass production this summer. What has been the most difficult part in making this happen, as a hardware startup? Gabe Grifoni: Time and money are probably always a problem for startups. However, in software, if you find a bug, you can work overnight or over two days, squash it, and your distribution channel is the app store. In hardware, if you run into a problem and say, oh crap, my audio is not working, you've got four hundred components, six layers of board, and traces everywhere. If I make a change to fix that, it's three weeks to get a new board, and even then you have to hope it worked. There's a lot more time in testing potential fixes. That time, because you have to physically send money to build boards and test things, make this a lot more of an expensive proposition. Plus, there's a lot more time to get hardware done and working, which makes it a lot harder than software! Gabe Grifoni: We're moving out of Make in LA to a new place, and will be going into production this summer. That's a huge step. Plus, we've hired a new CTO and CRO to help grow the tech and business side. We're really growing our customer relations. We've got a lot of customers lined up and trials will begin this summer. Production and trials will be a huge milestone, and will happen in the next few months. We're focused on building this right, and making sure it works as our customers expect it to work, and to address any issues quickly and handle what those enterprises need. This is a really big market, and we have a lot of opportunities here if we do things right.